First of all, the United Nations' legitimacy is unique. It is the only mechanism of international cooperation that relies on a solid foundation of international law and covers all spheres of human endeavour without exception: military-political, security, conflict resolution, development of economic and humanitarian cooperation and one more important function – modernisation of international law… Let me also point out that the UN puts special focus on supporting the countries that are emerging from a conflict. Peacebuilding is a concept for taking over from the peacemakers and helping with public administration and economics. With the unipolar world triumphant, a decline of the UN role turned out to be a short-term trend. With the changing balance of power in the international arena and the defamation of the US in its capacity of a world hegemon, the UN role of a negotiation venue for the world community (lacking internal integrity) will be only growing. The future of the UN and the entire world order directly hinges on the willingness and the ability of UNSC permanent members to constructively and responsibly shape their relations, finding ways to achieve mutual understanding on the most complicated and controversial problems, which means that an absence of agreement between the permanent members is not something to be interpreted as a free hand for unilateral action. The United Nations is the world's most influential international organization. The General Assembly sessions provide a unique opportunity for states to outline their views on current international issues, as well as make potentially groundbreaking progress in bilateral relations with other countries. With all its shortcomings and contradictions, the modern system of peacekeeping, based primarily on the legal principles and mechanisms of the UN Charter, is an effective mechanism for ensuring international security and world order. "Each state must protect its population" ─ this is what the autumn 2005 UN Summit Declaration said. The Russian delegation to the Summit was headed by Vladimir Putin. But the principle of "protection responsibility" has never been made into a law albeit the international community as one of the stakeholders now and again invokes it in crisis situations. With the world facing new challenges, UN peacekeeping is evolving. How are peacekeeping missions established? Who funds them? How are they composed? Do regional institutions contribute to them? What is Russia's role? What is the future of peacekeeping? To avoid new accusations of secrecy, the United Nations has taken a few steps to ensure representative consensus on the post-2015 UN development agenda. In January 2015, Ban Ki-moon established the UN System Task Team, which brought together over 60 UN entities and agencies. The group was aimed at providing analytical input, expertise and outreach to the post-2015 development agenda. The positions of China and India, the world's first and third largest emitters, are of key significance, as they had no quantitative obligations under the Kyoto Protocol. Hence, the format of their participation in a new agreement seems decisive. So far, Beijing and New Delhi have refrained from full-fledged obligations, only checking the cooperative aspirations of other countries that see countering the climate change as pointless without the participation of China and India. The United Nations is usually condemned for its inability to conduct comprehensive reforms, with this criticism chiefly directed at the UN Security Council. However, this is not the case, the UN is an organization that has a large number of bodies and other institutions within its system. While individual states can hardly achieve agreement on what the future Security Council or General Assembly should look like, reform in one of the most important and efficient areas of UN operation – namely, humanitarian work – took place in 2005. With the 70th anniversary of the United Nations celebrated this fall, France has made a big splash by proposing limiting the right of veto exercised by the permanent members of the UN Security Council, i.e. by Russia, China, United Kingdom, the United States and France. But these ostensibly good intentions of preventing crimes against humanity appear to be an attempt to pave the way for a UNSC blessing of unrestricted enforcement through military force. Today, the UN requires reform as well. The current environment and the UN Security Council structure reflect the geopolitics of 1995. But the world has changed and the United Nations must reflect the new reality. I was disappointed on having failed to complete the reforms when occupying the post of Secretary General. Anyway, concrete measures were proposed, and the reforms will take place sooner or later. I believe it will happen soon, otherwise the UN will face many problems. The reform of the Security Council is a matter for Member States, and they are still negotiating and discussing that issue. It is a very difficult process with clear sets of interests. He has said on the record that UN Security Council reform is both needed and overdue. If you take the long view and look at the functioning of the Council over the long term: it is actually a very dynamic body and it has changed and adapted considerably over time. Its agenda has also expanded considerably over time in recognition of the growing complexity of the world peace and security in the extent to which issues of development, environment and disease and scarcity are having impact on peace and security. I think this is the wrong question, since the UN does not have power on its own. The UN derives its power from the will of the 193 members of the General Assembly of the United Nations. When they agree to act, the UN does so. I don't think that this question should be addressed to the UN – it should be addressed to the member states and the Security Council. The Security Council is facing so many conflicts around the world that often it does not act. Why? Because if the five veto members – the US, the Russian Federation, China, the United Kingdom and France – do not agree on the action to be taken, what can the UN do? If the new members are given the right to veto, the Security Council will become a non-functioning body. Unfortunately, we witness that the principles of international law are violated. At the same time, however, we can't say that the UN does not work or that it is ineffective. The decisions that are made on important issues go along with the resolutions adopted by the Security Council. For the United Nations to be more effective, we need supporting organisations. The UN will be unable to cope with contemporary security issues with its own forces. An interrelated network of regional institutions should "lend a shoulder" to the UN in the creation of a new security regime. However, these institutions should provide support to the UN without replacing it. There is no magic formula to return the United Nations the prominence in the global system that it once had. Only by tackling the most important international issues will the organisation be able to see a revival. And if the leading countries, the permanent members of the UN Security Council, do not do this, others will start to take the initiative – the global "masses" and the General Assembly. The latter has long been irritated by the fact that the "elite" has monopolised the right, but in fact is unable to resolve a single issue effectively. Cand.Sc. (History), Associate Professor, International Relations and Russian Foreign Policy Department, MGIMO (University) at the MOFA of Russi, RIAC expert. Since 1945. Russia is the legal successor to the USSR which was one of the founders of the United Nations Organisation. Soviet Ambassador to the USA Andrey Gromyko signed the UN Charter on behalf of the Soviet Union on 26 June 1945. The USSR was from the start one of the five permanent members of the UN Security Council. After the collapse of the Soviet Union and after passing through the necessary procedures Russia officially took its place at the Organisation. 2,438%. Russia is the 11th biggest contributor to the UN budget its share under an approved scale being 2,438%. Allocated $325 million in 2014. Its total contribution in 2014, according to the Russian mission's information, amounted to some $ 325 million, including contributions not only to the regular budget, but to the budgets of peace-keeping operations as well as tribunals for the Former Yugoslavia and for Rwanda. Used 13 times over the past 25 years. Russia wields the right of veto as a permanent member of the UN SC. It exercised its veto right 13 times during the last 25 years (for comparison: USA used its veto 16 times, China 8 times, of which 6 times jointly with Russia). Russia has recently been using its veto right more frequently (four times in 2014–2015) the main reason being its sharpened confrontation with the West. This highlights the key differences of approach to international problems (Ukraine, former Yugoslavia, the Middle East). The right of veto has always been crucial in terms of safeguarding international peace and security. That is why Russia considers proposals on modifying this instrument (French and British initiative and an earlier initiative of Poland, statements by P.Poroshenko) to be unrealistic because they have a number of flaws and restrictions that lead directly to the disintegration of the UN and to chaos fraught with global cataclysms. Role of the UN as an international relations institution. Role of the UN as the venue for effective conflict resolution. For Russia, the UN remains the key institution for regulating international relations, which can be traced in all the foreign policy documents of the Russian Federation and in multilateral and bilateral treaties and declarations. The Concept of the Foreign Policy of Russia adopted in 2013 states that the current threats and challenges cannot be resolved "outside the framework of the UN Security Council" and calls for "joint efforts with the central coordinating role of the UN and with due account of the objective interconnection of the issues of security, sustainable development and the protection of human rights." It has to be noted that the basic shared principles of the BRICS countries are unconditional adherence to the UN Charter, preservation of the United Nations as the key element of international security and global governance, sovereignty as the fundamental category, and non-interference in the affairs of other states. President Putin of Russia recently stressed the advantages of using the United Nations as the base of forging a global anti-terrorist coalition. In general, Russia sees no alternative to the UN although it recognises that the Organisation is indeed in need of reform. From Russia's point of view, the UN remains a unique universal format for the interaction of the states of the world. The Organisation has considerable potential for keeping international peace and security and offers every state equal rights to uphold its national interests. The UN is the foundation of a democratic world order which Russia advocates. As regards peace-keeping missions, there is "a lag behind the exigencies of the time." Many experts note that although several clauses of the Russian Military Doctrine stress the importance of Russian troops' participation in peace-keeping missions there is still no Concept of the participation of Russia in peace-keeping. And yet work on the Concept was launched back in 2006. In the framework of the current 16 UN peace-keeping missions Russia has 66 servicemen (versus 110 in 2014) of whom 46 are observers and 20 are policemen. Based on the overall count, which includes observers, policemen and military contingents, Russia is in 77th place among 121 countries. It has to be remembered however that peace-keepers are much better paid than the national servicemen of many countries. This is one of the main reasons why the largest number of peace-keepers are provided by such countries as Bangladesh, India and Pakistan which have very low per capita incomes. 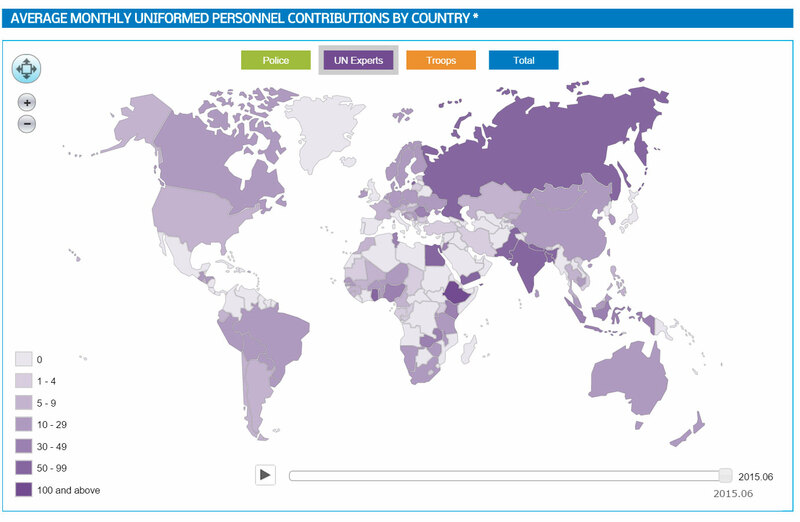 As for Russian contribution to peace-keeping operations, it is in the top ten (8th place with 3.15%). Russia's contribution is very modest compared with the amounts allocated by the USA (28.38%) and Japan (2nd place, 10.83%). However, if one compares the contribution with the size of GDP, Russia's record is quite good, especially if one compares its contribution to that of another country comparable to the US in terms of GDP according to PPP, ie. China (6.64%). The 70th anniversary of the end of the Second World War and the creation of the UN has again put to the fore the discussion on the need to reform the UN, above all the Security Council. New positions are claimed by the Group of Four countries (India, Brazil, Germany and Japan). Of late Russia's sympathies have been shifting towards the three BRICS partners because of Russia's reorientation to the South. The Russian position is as follows. A UN reform should provide greater and more equal representation of all the countries and regions, above all the developing states. In other words, Russia comes out for a reform, including the enlargement of the UN SC (with the preservation of veto by the permanent members), but it sees the consensus approach, without the sidelining of dissenting states, as the key to transformations. According to the formal rules a two-thirds majority is required, but the presence of big regional players in the opposition troika would have a negative impact on the functioning of the entire Organisation. The USA has been involved in the UN's work since 1945 г. 22%. The United States' contributions are 22% of the UN's regular budget and 28.362% of the budget for peacekeeping operations for 2014–2015. Its planned contributions to the UN's regular budget in 2014–2015 are about 1.2 billion dollars, and those to the peacekeeping operations budget for 2015–2016 are about 2.2 billion dollars. The United States has used its right of veto in the UN Security Council 79 times. During the Cold War the USA repeatedly expressed its dissatisfaction with UN decisions (in particular, on settling the Arab–Israeli conflict). However, at that time there was no alternative to the UN as an organisation with universal membership, legitimacy and sphere of competence. After the end of the Cold War, when the United States was left as the only superpower, the "one country, one vote" model for decision-making in the Security Council and the existence of the Security Council permanent members' right of veto restrained the Americans' global ambitions. The USA began to focus more on NATO as the main institution for global control in the military-political sphere and on the "G7" in the economic sphere. The "unipolar moment" in the 1990s and the start of the 2000s helped the United States' willingness to sidestep the UN when national interests required this. The Americans carried out military interventions in Yugoslavia (1999) and Iraq (2003) without a relevant resolution by the Security Council. In recent years, with the establishment of a multipolar system of international relations, the USA has been more inclined to follow the letter of the UN Charter. This is shown, for example, by Washington's attention to the UN Security Council's position on settling the crises in Libya and Syria and its unwillingness to take any steps without a Security Council resolution. The US National Security Strategy (2015) mentions the UN only once, in the context of the expansion of international cooperation, which testifies to the Americans' restrained attitude to the Organisation. At the same time Washington sees no alternative to the UN in the context of the establishment of a multipolar system of international relations. The United States has an interest in developing the UN's peacekeeping as a tool for maintaining international peace and stability and makes the biggest contribution to the budget for peacekeeping missions. Having the right of veto in the Security Council, the USA is capable of blocking decision-making on peacekeeping operations which do not coincide with its national interests. The USA supports reform of the UN to adapt it to modern realities. US officials expressed support at various times for including Japan and India in the permanent members of the Security Council. In addition, they supported replacing the UN Commission on Human Rights with the Human Rights Council made up exclusively of representatives of democratic states. The USA repeatedly emphasised the need to increase the transparency and international accountability of the UN's budgetary policy. According to a report by the United States Institute of Peace Working Group on UN Reform in 2005, the USA has an interest in the following areas of reform for the UN: carrying out institutional reform; increasing effectiveness in countering terrorism and the proliferation of weapons of mass destruction; developing a UN strategy and special measures to counter genocide, mass murders and human rights violations; expanding support in the fight against poverty in developing countries, and developing peacekeeping capacity. Since 1971. Under the United Nations General Assembly Resolution 2758 "Restoration of the lawful rights of the People's Republic of China in the United Nations" of 1971, China was admitted to the United Nations and became a permanent member of the UN Security Council. It inherited the status from its predecessor, the Republic of China (ROC), which currently controls Taiwan and the adjacent islands. 5,148%. Under the resolution adopted by the 67th session of the General Assembly on 24 December 2012 "Scale of assessments for the apportionment of the expenses of the United Nations for 2013–2015," China's contribution to the regular budget of the United Nations amounts to 5.148%. China is therefore the sixth largest contributor to the regular budget of the United Nations. 6.64% of the budget of the UN peacekeeping operations. Sixth-largest contributor. When it comes to China's contributions to the UN peacekeeping operations, it amounts to 6.64%, under the resolution adopted by the 67th session of the General Assembly on 24 December 2012 "Scale of assessments for the apportionment of the expenses of the United Nations peacekeeping operations for 2013–2015." 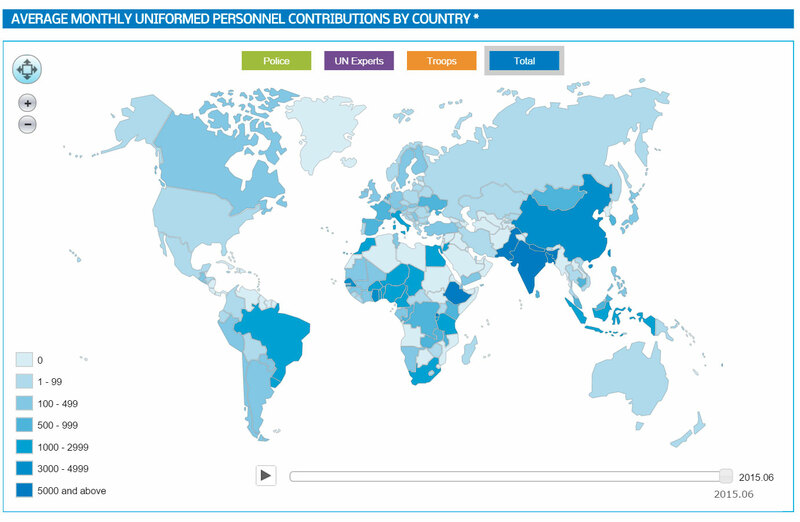 China currently ranks sixth among the member states by the amount of its contribution. Ever since the PRC became a permanent member of the UN Security Council in 1971, it exercised its veto right nine times. The ROC exercised this right only once in the period from 1945 to 1971, in 1955, when it voted against the admission of the Mongolian People's Republic. Official China emphasises the importance of the United Nations, pledges to firmly support the UN, considers it the world's most representative and authoritative intergovernmental international organisation, the most significant platform for multilateral diplomacy, which has made a major contribution to the maintenance of peace on the planet and facilitation of cooperation in peace. The Chinese authorities note that as a permanent member of the UN security Council and the world's large developing nation, China has heavy responsibilities to assume and has the capability to assume them. Beijing actively initiates, supports and adheres to multilateralism, permanently protects the main rights and principles of the UN Charter, authority and role of the Organization, pays close attention and conscientiously implements the UN millennium development goals. It is emphasised that China intends to continue to actively participate in UN initiatives while stepping up the level of bilateral engagement. Voicing the position of mutual prosperity, support for peace and development, China substantiates the message that the two sides need each other. China's further involvement in the UN activities is fully in line with its foreign policy priorities: promotion of the vision of China as a strong global player, full-scale participant in international relations, development of its image as a sort of leader for developing nations, protector of weaker and smaller states, and ambitions to leadership in Eastern Asia and the Asia-Pacific Region. China's current status in the United Nations has a triple nature — it is a permanent member of the UN Security Council (the only permanent member in Asia); a superpower that has sufficient military and political potential to influence the entire system of international relations; and an original member of the UN, i.e. a signatory to the UN Charter in San Francisco on 26 June 1945. This enables China to use the United Nations as a platform to demonstrate its aspiration for peace and stability, increased role in ensuring regional and international security, military build-up, and "soft power" policy. In 1988, China became a member of the UN Special Committee on Peacekeeping Operations, which became the starting point for its engagement in UN peacekeeping endeavor. In 2001, the Peacekeeping Office was established at the Ministry of National Defense of the PRC, which was made responsible for the control of contingents of the People's Liberation Army engaged in the UN peacekeeping operations, training of personnel, and exchange of experience. The first ever peacekeeping operation involving Chinese specialists was held in 1990. Since then China has provided a total of 23,461 peacekeepers (as of June 2015), more than any other permanent member of the UN Security Council. China has stepped up its involvement in the UN peacekeeping operations as soon as the so-called fourth generation of leaders came to power, associated with President Hu Jintao (2003–2013), who put forth the foreign policy doctrine of "China's peaceful rise" in 2003, which was eventually replaced by the "soft power" policy concept. Since that time, the number of peacekeepers provided by China has consistently increased, exceeding 2,000 personnel almost every year (as of June 2015, a new record high of 3,082 people was reached). China does support the idea, but refrains from action. At present China supports the idea of reforming the United Nations and its core institutions. However, it refrains from action, calls against stepping up reform-related activities and artificial timeframes, citing the need for the broadest possible consensus concerning the new permanent members of the UN Security Council. Official Beijing avoids making specific proposals and shows propensity for emotional deliberation that international order should correspond to the spirit of the age, multipolarity and globalisation, that the interests of developing countries need to be asserted, as they make up the absolute majority of the UN member states, and their representation at the Security Council should be promoted. Beijing thus seeks to minimise the likelihood of unfavorable scenarios associated with the possible admission of the three real contenders — Japan, Germany, and India (or any other major third world country). In this case, China will lose its unique status of the only Asian nation represented in the Security Council as its permanent member and cede the mentioned benefits resulting from its triple status. Further, the possible changes in the Security Council may bring about "dispersal of power," when the "weight" of some countries in the Council dramatically reduces (given the admission of new members), which will lead to alterations in every country's status internationally. Another sensitive issue associated with the UN reform is the revision of its Charter. If the notion of the "UN member state" should be expanded, new legal grounds will emerge to encourage Taiwan to seek membership in the United Nations. This is fundamentally disadvantageous for Beijing because of its official position on the "existence of a single China and Taiwan as its integral part." Since 1945. The international status of post-war France took some time to be clearly established. In June 1940 the country suffered a debacle losing the entire territory of the mother country and a substantial part of its colonies. The National Liberation Committee in exile was only recognised by the Allies as the representative of the French Republic after some political struggle and the USA and Great Britain were unhappy to see General Charles de Gaulle as its leader. France did not join the Big Four of the countries that were the first to sign the United Nations Declaration in 1942 and only acceded to the document two years later. It was not until the final stage of the Second World War that it was decided at the Dumbarton Oaks (1944) and Yalta (1945) conferences that France would, after all, take part in the peaceful settlement as a victor power. That status guaranteed France a permanent seat on the UN Security Council. Today France is the fourth largest contributor to the UN budget. In 2015 its financial quota accounted for 5.59% of the total budget (129 million euros). As of 2015 France is involved in 16 expeditions under a UN mandate. It is even more active in peace-keeping under its own flag or within NATO and EU coalitions. Since 1945 France, as a permanent SC member, used its veto right 18 times. It was only on one occasion – in 1976 when independence for the French Comoro Islands was discussed – that France blocked the resolution alone. In all other cases it exercised its veto power together with Great Britain and the USA. Even in that form the last time it used its veto was in 1989 (resolution on the situation in Panama). The importance of a country's involvement in the work of the UN at the highest level is practically not questioned by the national political elites and in academic discourse. If there are discussions they have to do with the degree of French influence at the Security Council. On the one hand the status of a permanent SC member lends it certain weight in international affairs. On the other hand, the record of its use of veto shows that on key issues the French delegation is singing from the same hymn sheet with the American and British colleagues. France's influence at the Security Council was really apparent only in 2003 when it used the Council as a rostrum for criticizing US actions in Iraq. Even so, France's role should not be underestimated in one of the UN's key areas of activity, in peacekeeping operations. Not infrequently it is the Fifth Republic that raises the issues of crisis settlement on the African continent with which it has a long history of relations. Considering its close historical, political and linguistic ties with Francophone Africa, France sees it as its "zone of responsibility" where it plays the role of arbiter in armed clashes. The recent years have shown that the world community shares the French arguments in intervening in conflicts. The Security Council approved the actions of the French units by sending a UN peace-keeping contingent (to Cote d'Ivoire in 2011 and the Central African Republic in 2014) or by giving political support (in Libya in 2011 and over Mali in 2013). Obtaining the UN mandate for peace-keeping in this or that country is one of the key areas of French diplomatic efforts at the UN. The country contributes actively to financial guarantees of peace-keeping missions (the third biggest contributor to the operations' budget, with a quota of 7,21% ). At the same time France is a staunch supporter of reforming the UN. Of all the projects of redistributing seats at the SC France is most averse to the idea of merging the memberships of West European states into a single representation of the European Union. France favors "diluting" the privileges of permanent membership among new members. Its draft would give permanent seats to Germany, Brazil, India and Japan, one Arab country and one African country. In addition, French President Francois Hollande in 2013 proposed a "gentlemen's agreement" among all the veto wielders (without introducing amendments to the UN Charter). The powers would agree not to block single-handed resolutions on international crises and armed conflicts in order not to paralyse the work of the Council. Lately the French diplomats have been conducting active consultations on UN reform seeking to enlist support for the French project. The Fifth Republic still seeks to position itself as a centre between USA-Britain and Russia-China. This might enable it to make the biggest contribution to improving the UN structure. The United Kingdom became a member of the United Nations immediately upon its establishment in 1945. In the capacity of one of the victorious powers, it was directly involved in the negotiations for the establishment of a global organisation which would serve to ensure peace and security. The first meeting of the UN General Assembly was held in London in 1946. 5.179%. In 2015 the total amount of contributions made by the United Kingdom to the UN totalled 154,140,914 USD, or 5.179% of the Organization's total budget. Historically, the UN missions made up a relatively insignificant part of the total number of operations the UK Government initiated aiming to ensure peace and security. The United Kingdom has always viewed peacekeeping efforts not only as an important element of the global conflict resolution architecture, but also as an opportunity to expand its influence area. During the Cold War in conflict regions the superpowers military forces "non-participation" principle was applied. This principle was approved by the UN Secretary-General in the 1960s within the framework of elaborating a decision regarding the operation in the Congo. However, as early as in 1964 an exception was made for the United Kingdom: military forces of the United Kingdom were allowed to participate in the separation operation in Cyprus (the operation is still on). Britain involved its most numerous military forces (more than 8000 people) in the peacekeeping operation in Bosnia in 1995. Since that time London has considerably reduced the number of forces, participating in the UN missions. UK Government acknowledges that the UN is a reputable institution for foreign affairs with a fundamental role in settling of global issues. Within the scope of the UN activities, coalition government of the Tories and Liberal Democrats (2010–2015) facilitated settlement of such international problems as combatting the financing of terrorism, establishment of the UN's mission aimed at rendering assistance to Somalia, countering sexploitation within conflict zones. London gives credit for the UN's potential regarding resolution of global conflicts and focuses on NATO-related activities as well as cooperation with its allies in international coalitions and associations in order to settle international conflicts. The National security strategy of the United Kingdom stipulates that it mostly relies on cooperation with the USA, and also the EU, NATO and the UN Security Council for protection of its national interests, in particular, in the area of security. It is particularly remarkable that the UN Security Council is at the end of the list. At present the United Kingdom shows concern about decline in work efficiency of the Council as an institution dealing with settlement of disputes and conflicts. As of January 31, 2015 the United Kingdom participates in four UN peace-support missions with total forces consisting of 289 people. British peace-makers, in particular, are involved in the UN multidimensional integrated mission for stabilization in Mali, the UN mission for stabilisation in the Democratic Republic of the Congo, the UN peace-keeping forces in Cyprus (the most numerous British forces are concentrated there – 274 people) and the UN Mission in the Republic of South Sudan. In fact, we can call involvement of London in peacekeeping operations initiated by the UN insignificant. Nevertheless, Britain ranks fifth in terms of the amount of contributions to the UN peacekeeping funds within the framework of the UN missions financing. 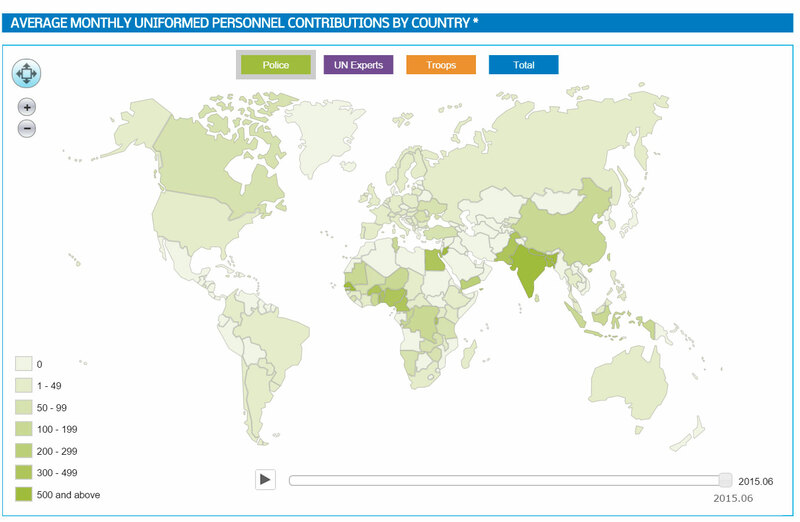 Its contributions make 6.68% of the UN missions' total budget. However, the missions themselves are a relatively small fraction of the total number of operations conducted by the UK Government aiming to ensure peace and security. The United Kingdom views peacekeeping efforts not only as an important element of the global conflict resolution architecture, but also as an opportunity to expand its influence area. Apart from the UN missions, Great Britain actively engages its military forces in coalition operations under the leadership of the USA and in the operations conducted under the aegis of NATO. In particular, it is actively involved in Rapid Response Forces in Eastern Europe, established at the summit in Wales in 2014. London also joined a military operation against "Islamic State", which was conducted by the coalition of states led by the USA without the UN Security Council's authorization. It seems there will be no dramatic change in the United Kingdom's attitude to the UN's peacekeeping operations in future. London will keep lending support to the UN's peacekeeping concept with the help of diplomatic methods and financial assets, although direct involvement of the United Kingdom's military forces in such operations will be minimal. The United Kingdom has blocked the UN Security Council's resolutions 29 times. For the first time it used its veto power in 1956 during Suez crisis by blocking two resolutions, condemning Israel's military incursion into Egypt. Moreover, the first project was developed by the USA, while the second – by the USSR. Apart from that, the United Kingdom blocked 7 resolutions concerning Southern Rhodesia (in 1963–1973), 8 – concerning South Africa, 8 – regarding the situation in Namibia. In 1982 the United Kingdom blocked a draft resolution regarding cease fire within the territory of the Malvina (Falkland) Islands, suggested for consideration by Spain and Panama. From 1986 to 1989 English representatives blocked two resolutions, condemning aggression of the USA in Tripoli and Benghazi, Libya, and also American military manoeuvres in close vicinity to Libyan borders. Last time London exercised its veto power was in 1989 in relation to the draft resolution condemning intervention of the US armed forces in Panama. The United Kingdom is a proponent of an idea of the UN's adaptation to new reality. Country's top leadership has repeatedly urged to use the memorable date of the 70th Anniversary of the UN as a trigger for resuming discussion about reforming of the Organization. As early as in 2008 the United Kingdom and France expressed their common standpoint on the issue in their joint declaration. Both countries advocate more balanced representation of the countries of the world in the UN Security Council. Great Britain proposed to enlarge the Council by way of inclusion of new permanent members (Germany, Brazil, India, Japan), and also by introducing "African representation". Apart from that, London proposes to make the process of the Secretary-General appointment more transparent, to approve a specific procedure of filing applications for this position and to provide for formal address of each candidate to the General Assembly. At present, pursuant to the Charter of the United Nations Organization, the Secretary-General is appointed by the General Assembly upon the recommendation of the Security Council. It should be noted that the United Kingdom supported proposal made by France concerning restricted veto power in the UN Security Council in case urgent measures are required in order to curtail mass crime. Since 1973. The history of Germany's UN membership is probably unique. First, in September 1973 the UN admitted not one but two German states, the FRG and the GDR, which gave a push to their final recognition by the two opposing political blocs. Germany's repeated attempts to gain admission to that key international organisation were blocked by the UN Charter's provision concerning "aggressor states" (Articles 53, 77 and 107), a clear reference to the FRG as the legal successor to the Third Reich. It was not until 1995 that these provisions were dropped as outdated. The early contacts of (the then still divided) Germany with the UN were in the context of humanitarian cooperation with UN agencies and structures (UNICEF, UNRRA) and the UN High Commissioner for Refugees. These organisations were helping Germany to overcome the economic consequences of the Second World War. The official division of Germany by the Iron Curtain and the fact that the dividing line of the Cold War could at any moment turn into the frontline of a real war put the German question high on the UN agenda. Back in the 1950s the FRG became a member of practically all international organisations in the UN framework: WHO, UNESCO and others. The phenomenon was dubbed "active non-membership." Unlike the FRG in the 1950s and 1960s, the GDR did not take an active part in the work of the UN specialised agencies. The Hallstein Doctrine consisting in the isolation of the GDR on the part of West Germany in the international arena, coupled with the peak of the Cold War, precluded the involvement of the GDR in the work of the UN. Until 1972 it did not even have observer status with the UN. The admission of both German states to the UN coincided with the pivot of the FRG policy towards the East (under Willy Brandt) and the formation of new states on the fragments of former colonies in the Third World. This left an imprint on the way the German states felt within the UN. Both states were actively engaged in environmental, cultural and health programmes. Still, compared with the permanent Security Council members their work within the UN looked secondary, not least due to the above-mentioned paragraphs in the UN Charter. Germany's contribution to the UN is impressive, in 2013 it stood at about $180 million a year, or 7.1% of the total UN budget. This shows that the FRG is very interested in the functioning of that organisation, but also the traditional approach of post-war Germany that preferred financial participation in solving international problems while being rather less willing to take part in "blue helmet" missions. Before reunification with the GDR in 1990 the FRG practically did not take part in peace-keeping missions fearing that German soldiers, even if they wore blue helmets, would be associated with the soldiers of the Third Reich. The situation changed dramatically after 1990 when a new ere in Germany's foreign policy began and the character of its participation in the work of the UN changed. The united Germany felt constrained within the framework of an "aggressor state" and German diplomacy adopted the course for the country's political emancipation within the UN with a view to eventually becoming a member of the Security Council. In the late 1970s and early 1980s the FRG and the GDR were non-permanent SC members. Later united Germany had this status in 1995–1996, 2003–2004 and in 2011–2012. A radical change took place in the 1990s during the war in Yugoslavia when the Bundeswehr took part in the peace-keeping mission in Bosnia and Croatia and in NATO's aggression against Yugoslaiva in 1999 launched without the UN mandate. The Schroeder government that succeeded the conservative cabinet decided to scale down its activities in military operations. While supporting its NATO allies in the missions in Afghanistan and Africa, Germany refused to join the war in Iraq, much to the dismay of the United States. Apart from the Bundeswehr's participation in the Kosovo and Afghanistan campaigns (carried out under NATO and not UN aegis) it can be said that the scale of Germany's participation in UN peace-keeping missions has been fairly limited. As of the end of 2012 a little over 200 German soldiers were involved in peace-keeping operations. Germany's financial and organisational involvement in the work of the UN is much more significant. As of the end of 2013 its annual contributions to the UN budget topped $200 million (third place in the world after the USA and Japan, about 7.1% of the total UN budget). In some years Germany's financial involvement in the UN amounted to 8–8.5% of the total budget, which attests to its considerable role in the functioning of UN structures. Besides, Germany hosts the headquarters of many UN organisations. Germany has no veto right. Nevertheless its government considers the UN to be a key forum for discussing international security and settling conflicts. In parallel Berlin pursues a policy of two- and three-way models of peace-keeping diplomacy, for example, the Normandy Format of negotiations on settlement in Donbass. In any case the German Foreign Ministry does not share the pessimism of some skeptics who think the UN has outlived its usefulness. Moreover, Germany hopes to gain a more important place at the UN by taking part in its reform. Germany perceives the UN as an important international relations institution along with other international organisations. Witness its attempts to upgrade its status within the UN and its active involvement in various aspects of its activities. Although the scale of its involvement in peace-keeping missions is modest, Germany is one of the guarantors of world security above all because of its political and economic weight. Within the UN framework and using its mechanisms Germany is re-entering big-time politics gradually shedding its political complexes developed as a result of events in the 20th century. There is reason to believe that in the coming decades Germany's role in the UN, notably in the context of the migration crisis in Europe, the conflict in Ukraine, etc. will grow. Active involvement. Beginning from the 1990s the aim of German foreign policy has been to gain the status of permanent member of the UN Security Council. To achieve that goal the German government has actively supported the UN reform initiatives. True, in the late 1990s it preferred the idea of collective membership of the European Union. However, it was clear that neither France nor Britain would give up their status of permanent SC members in favour of collective EU membership. In the 1990s united Germany actively joined the process of reforming the UN. The federal government did not only take part in the reform coming up with concrete proposals on making the UN more effective, but used it as an instrument to increase its geopolitical weight drawing on many years' experience of taking part in humanitarian and peace-keeping programmes. It scored a major victory in 1995 when the provisions on "aggressor states" (referring above all to Germany) were dropped from the UN Charter. Thus German policy with regard to the UN could be summed up as follows: promoting the reform of the UN in order to gain full membership of the SC by increasing the number of member states. However, attempts to reform the UN stalled in 2005 and the idea of Germany becoming a fully-fledged member of the UN's supreme body was put in cold storage. Since 1945. Brazil is one of the 50 initial founding members of the United Nations Organisation (since 24 October of 1945 г.). In 2013 it contributed 2.9% of the UN budget. To date Brazil has been elected as a non-permanent member of the UN Security Council ten times: in 1946–1947, 1951–1952, 1954–1955, 1963–1964, 1967–1968, 1988–1989, 1993–1994, 1998–1999, 2004–2005 and in 2010–2011, the last time with 182 out of 183 countries voting for it. Since the late 1990s Brazil, in addition to its traditional claim to regional leadership, staked a claim for greater political influence in the world, a tendency that increased under President Luiz Inacio Lula da Silva (2003–2011), whose economic policy and social programmes powered Brazil's unprecedented leap forward in social and economic terms and consolidated its position as the largest economy in the region. Its growing might fueled its global ambitions as Brazil sought to play an ever more visible role in world politics using above all the UN to achieve its goals. Specifically Brazil took an active part in peace-keeping. Since 1956 it took part in 46 out of the 65 UN peace-keeping missions, and the number of Brazilian peace-keepers increased noticeably in 2005. Brazil has no veto right. Brazil is a member of all the specialized agencies of the UN and is actively involved in discussing global issues on the UN agenda seeking not only to promote its position, but to share its experience of grappling with such problems as poverty, hunger and global climate change. In addition to beefing up its participation in UN peace-keeping missions Brazil offers its mediation in overcoming regional and bilateral conflicts such as the conflict between Israel and Palestine, the West and Iran and the recent conflict between Venezuela and Colombia. Brazil has demonstrated its commitment to joining the club of leading world powers and one can safely say that it will remain active within the UN seeking to become a veto-wielding permanent Security Council member. Brazil seeks to become a permanent UN SC member with veto power and comes out for the reform of this body. Its main argument in support of reform is that the Security Council in its present composition does not ensure equal representation of the regions. Another argument Brazil advances is that in spite of cardinal changes in geopolitics and the global balance of forces that took place since 1945, neither the UN nor its Security Council have undergone substantial changes, which means that they no longer correspond to current reality. Since 1945 as British India (a colony of the United Kingdom), since 1947 as a dominion and since 1950 as a Republic. In accordance with UNGA Resolution 69, in 2015 India will contribute 19,821,944 dollars to the UN, which is 0.666% of the total country contributions. The second biggest country in terms of numbers of peacekeeping soldiers. India is one of the biggest providers of peacekeeping forces for the UN. Since 1950 it has sent about 180,000 soldiers and police to serve in UN forces and has taken part in 44 peacekeeping operations. In 2014 India became the second biggest country in terms of its number of UN peacekeeping soldiers (8,123), and these were involved in 12 peacekeeping missions and operations. India has no veto right. India considers the UN a key institution for multilateral diplomacy, a central element in the system of international relations and an important instrument for creating multilateral systems to secure a stable and fair world order. India is actively involved in the work of the Organisation, in particular in implementing the UN Development Programme, in achieving the Millennium Development Goals, in the Agenda for the 21st Century within the framework of the work of the UN Commission on Sustainable Development and the Johannesburg Plan of Implementation. New Delhi consistently calls for peaceful settlement of any conflicts, support for peace and stability, action against international terrorism, climate change and other global challenges and threats, pointing to the UN exceptional role in these processes. India is in favour of adapting the UN's structures and systems to global challenges and threats, including reforming the Security Council so that it "reflects contemporary geopolitical realities". The report by former UN Secretary General Kofi Annan, "In Larger Freedom: Towards security, development and human rights for all" (2005), is of special interest with regard to this. It emphasises the need to reform the Security Council so that "it reflects the international community and today's geopolitical realities more broadly", and to increase the number of its members in order to achieve this goal. New Delhi believes that there needs to be an integrated reform of the UN. As former UN deputy secretary-general Shashi Tharoor said, in order to achieve more successful cooperation, the country "would like to see the modernisation and strengthening of other UN bodies, such as the General Assembly and the Economic and Social Council, and also an intensification in the work of various UN funds, agencies and programmes, the effectiveness of which is important for many vulnerable people in developing regions". India possesses a nuclear capacity, has a dynamically developing economy, and plays an increasingly active role in the international arena. As a result of this, it insists on its right to receive the status of a permanent member of the Security Council. Believing that the Security Council already fails to reflect the realities of the modern world order, India, as part of the "group of four" (together with Brazil, Germany and Japan), advocates an expansion of the Security Council to 25 members (10 permanent and 15 non-permanent), on condition that the new permanent members do not use the right of veto for 15 years until the completion of the UN's reform. India hopes that the question of reforming the Security Council will be thoroughly discussed during the 70th anniversary session of the General Assembly, since after inter-governmental negotiations the parties have managed to achieve concrete results in the form of a single agreed document. Since 1956. After Japan's capitulation in the Second World War one of the main tasks of its foreign policy was regaining the international status it had before the war. That is why accession to the UN was seen as an important step on the way to making Japan again a leading player in the region and in the world. After the singing of the 1951 San Francisco Peace Treaty which ended the state of war between Japan and the majority of Allied states, Tokyo applied to join the UN in 1952 and again in 1955. However, the Soviet Union vetoed the candidacy on both occasions. Japan saw Moscow as the last obstacle on the way to joining the UN which is why the process of normalizing relations between the USSR and Japan was initiated. The signing of a joint Soviet-Japanese Declaration in 1956 was a logical outcome of the process. In accordance with Article 4 of the document ("The Union of Soviet Socialist Republics will support the application of Japan to become a member of United Nations Organisation") that same year at the 121st session of the UN General Assembly Japan became the 80th member of the UN by a unanimous vote. 17%. Over time Japan contributed well over $20 billion to the UN budget and to the budgets of peace-keeping operations. The USA is the only country whose contribution to the UN over the past thirty years has been greater than that of Japan. Today the Japanese government contributes 17% of the UN budget. Japan has no veto right. Tokyo considers the UN to be an important instrument of resolving common international problems such as disarmament, nuclear non-proliferation, the fight against poverty, environmental protection, etc. Far more importantly, however, Japan seeks to use UN mechanisms to solve its internal and regional problems including the problems of security and the kidnapping of Japanese citizens by the DPRK special services, sparing no money to achieve that goal. Japan takes an active part in peace-keeping operations the biggest of which were in Cambodia, Mozambique and on the Golan Heights. The country's contribution is not confined to financing. The 1992 Law on Peace-Keeping Missions stipulates the scale of participation in such operations in the UN framework. Under the Law, Japan can deliver humanitarian aid (sending medical personnel, engineers, builders, etc. ), but, significantly, send to conflict zones a limited logistical support contingent. Being aware of the importance of these measures, Japan plans to increase its presence in peace-keeping operations. However, the Japanese Foreign Ministry insists that although the world community expects Japan to be more actively involved, "we have strict constitutional limitations." Tokyo is actively promoting the idea of reforming the UN Security Council. There is a sense that Japan as one of the world's leading economies and one of the main sponsors of the Organisation has the right to be a permanent member of the SC. This year Japan took part in elections to the Security Council for an 11th time hoping to secure a seat for itself. It is interesting that Japan is the longest-serving non-permanent member of the SC and a member of the Group of Four. Prime Minister Shinzo Abe had this to say on the issue: "First of all, as regards the reform of the Security Council we have no more time to discuss it. The time has come to achieve concrete results. With assured pride of its accumulated achievements Japan is ready to assume the role of permanent member of the Security Council. This has been the case up until now and this will be the case in the future." Next year the country will mark the 60th anniversary of its accession to the UN. This spells a new spiral of intense arguments over the issue. Produced by: Daria Khaspekova, Maria Smekalova, Maria Gurova, Irina Sorokina, Alexander Teslya and Dmitriy Puminov.